Sara Lee's sale of its North American Bakery business is now fully baked. The company announced today that it's selling the unit to Mexico's Grupo Bimbo for $959 Million. The deal follows earlier reports that a sale was imminent. Sara Lee (SLE) says it's now better able to focus on other parts of its business, like its fast-growing international beverage operations. Sara Lee expects the Grupo Bimbo deal to close in the first half of next year. "The sale of the North American Fresh Bakery business will allow us to aggressively invest in our core protein and coffee businesses. In both categories, we are a leading player, with healthy margins and a strong track record of innovation. We are actively pursuing growth here, organically and through acquisitions," said Marcel Smits, Sara Lee's interim CEO. Sara Lee, Grupo Bimbo and the bakery industry have lately faced severe competition where cutthroat pricing has led to lower revenue and profits. Sara Lee, which also reported its first-quarter results today, noted that its North American fresh bakery business posted a 4.6% drop in net sales to $516 million in the quarter. The unit reported an operating loss of $1 million in the quarter, compared with income of $14 million last year. The deal is expected to expand Grupo's Bimbo Bakeries USA, allowing it to enlarge its footprint in the U.S., particularly in the Midwest and Southeast. Bimbo Bakeries currently has a base in the Northeast and Texas. The combined companies, with 28,000 employees, will operate 75 bakeries in 31 states, and serve customers through a network of more than 13,000 routes. And over the next the five years, Bimbo Bakeries USA expects to invest $1 billion in its manufacturing and service operations. "We will build new bakeries where we need them. We will renew existing facilities. And we will improve our technology and infrastructure," BBU President Gary Prince said in a statement. According to the companies, the merger will bring Sara Lee's Soft and Smooth products under the same roof as Bimbo Bakeries' Thomas', Oroweat, Bimbo and other brands. 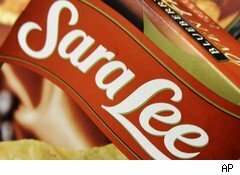 Sara Lee was up a slight 0.61% to $14.80 a share in premarket trading, over the previous day's close.